Hey, picture uploads are working tonight! 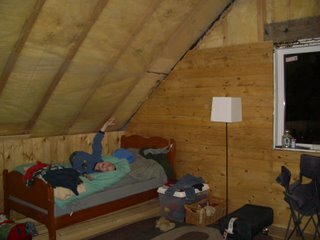 In the loft, you can see The Boy in his bed, showing off his room - the back wall is about one third done, and the loft railing is finished all the way around. The Boy also tidied everything up and got some space cleared for his grandparents, who arrive on Sunday. 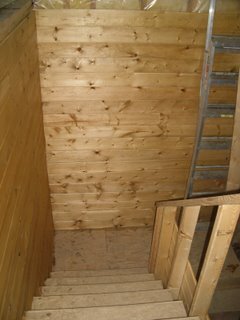 This is the hallway between the loft and the main floor - The Boy stained these walls and did a marvellous job. The boards don't go all the way up the dividing wall, nor all the way up the back wall, but it is a start. Not much additional work happening tonight - it's been a long week for me at work, and I will be here sawing and nailing and staining all of Friday and Saturday, so I think I can swing a night or two without construction. The Boy and The Dog are outside running around - they've gone down by the creek to play a bit, and were followed by the cats. My goodness they look adorable. Yup, this is why we moved out here. And here we are, on a Saturday morning..